This proven, ultra-lightweight package features weather-resistant combined instrument electronics and winch in a single 25 Kg (55 lbs) small foot print unit. A dual-purpose tripod and accessories are shipped with every system. Add your own PC or an MSI pre-loaded PC/printer combination and MSI downhole probes to complete the system. 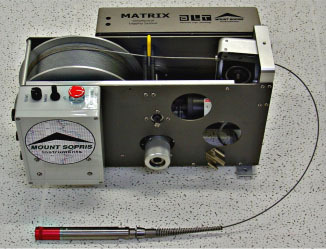 Each unit is delivered with an emergency hand crank, integral precision hardened steel depth-measuring wheel, optical encoder, and LED depth and telemetry indicator display. The unit can be spooled with either 200 meters (656 ft) of 3.17mm dia. (0.125”), or 305 meters (1000 ft) of 2.54mm dia. 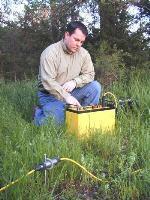 (0.1”) geophysical logging cable.